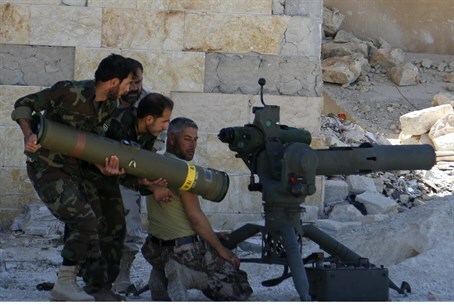 Syrian rebels, led by the Al-Nusra Front, launched assault on the government-held city of Idlib. Syrian rebels, led by Al-Qaeda loyalists. launched a major assault on the government-held city of Idlib on Monday in a bid to consolidate their control over the northwest, a monitoring group told AFP. Rebels seized control of most of Idlib province early in the three and a half year old civil war but troops have held out in the provincial capital, resupplied by air. Fighters from the Al-Qaeda affiliate Al-Nusra Front and Islamist rebel units attacked the city from all sides, the Syrian Observatory for Human Rights said. "Since dawn, fierce fighting has raged at army checkpoints all around Idlib city," said the Britain-based monitoring group, which has a wide network of sources inside Syria, according to AFP. At least five rebel fighters were killed, the Observatory said, adding that it had no immediate word on any army losses. Rebels made a previous attempt to take the city earlier this year but Monday's assault was "unprecedented, the biggest since the beginning of the revolt" in 2011, Observatory director Rami Abdel Rahman told AFP. Abdel Rahman said that the rebels had activated sleeper cells inside Idlib to launch attacks on the army behind its lines. He said policemen who sympathized with the rebels joined the insurgents in a brazen attack on a key official building in the city. "Policemen backed by sleeper cell members of Al-Nusra, already inside the city, attacked the governorate building but they were quickly pushed back out by regime forces," said Abdel Rahman. The civil war between Syrian President Bashar Al-Assad’s forces and rebels trying to oust him continues, though much of the world’s attention has turned towards the battle against the “Islamic State” (ISIS). Several weeks ago, gunmen assassinated a Syrian lawmaker in the restive central province of Hama.